Back in April, we announced Duel Decks: Speed vs. Cunning and sent minds racing as to how we would represent both sides of that particular coin. 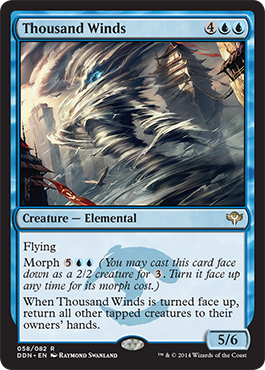 Sure, blue was pretty much a shoo-in for the Cunning deck, but there was any number of ways that you could match up Magic's brute force against some of its trickier cards. We got our first glimpse of how those decks would look when Zurgo Helmsmasher and the new-look Arcanis the Omnipotent were revealed as the faces of the decks. 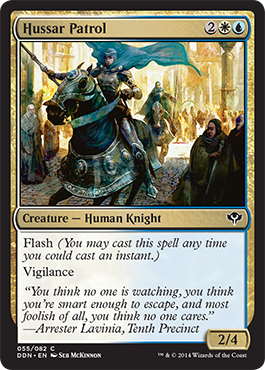 If Zurgo didn't pique your interest, then surely that new Arcanis art tripped your trigger. 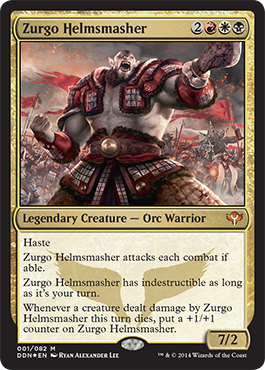 And if drawing bunches and bunches of cards isn't your cup of tea, surely you were excited at the prospect of positively smashing face with Zurgo, the Mardu clan leader from Tarkir. But enough fooling around. Today we're going to show you everything at once. That's how Zurgo would do it. Before I could show you the sweet, sweet cards contained within, I had to check out the product myself. 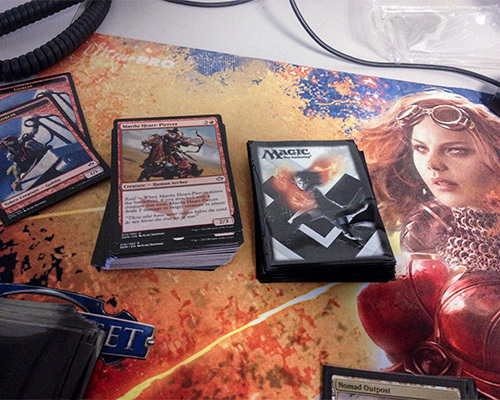 That meant breaking open a box and playing the decks against one another, against others around the office. Because my job is the worst. Step 1: Sleeve the decks. 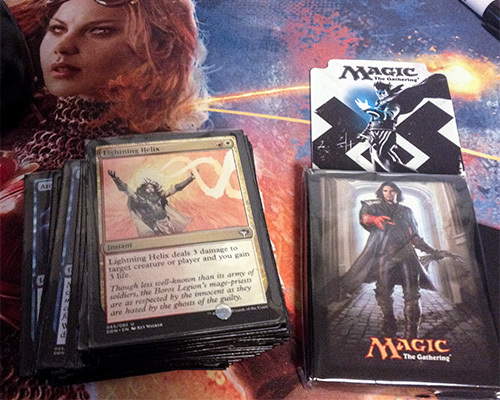 The Cunning deck is actually a Jeskai-flavored deck—as in blue, red, and white—so cards like Lightning Helix are right at home and Dack Fayden seems like a solid choice for the sleeves. The Chandra playmat seems to approve. It looks like Zurgo wasn't willing to smash face without one of his raiding buddies, or, rather, one of his raid buddies. 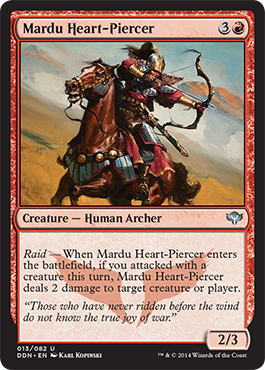 Raid is an ability that triggers if you've attacked with a creature that turn, encouraging you to do something you probably want to be doing in Mardu anyway. 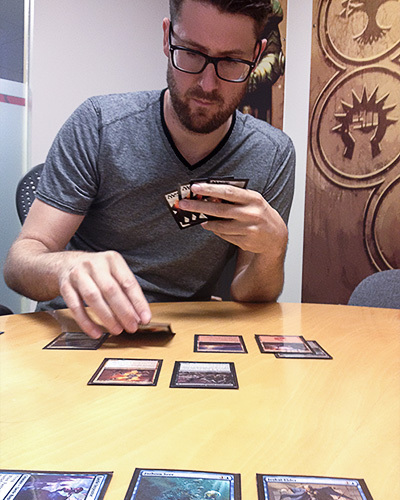 Okay, now that we found one of the new cards and sleeved up everything, it was time to find someone to smash play against. Luckily, we have no shortage of people like that around the office. First up was Nate Price, coverage writer extraordinaire and newly minted organized play community manager. Nate felt the need for Speed, and I was happy to oblige. That card in the bottom right doesn't look terribly familiar. Is it new? I started off in one of the best possible ways, as Lone Missionary gave me a life boost and an early blocker. Swift Justice on the Missionary even let me cast a Hellraiser Goblin and prevent Nate from starting out too...well, speedy. But Nate wasn't done yet, calmly tapping four mana and dropping Beetleback Chief on to the table. Repeal may have received new art, but it handles tokens just as well as it always has. 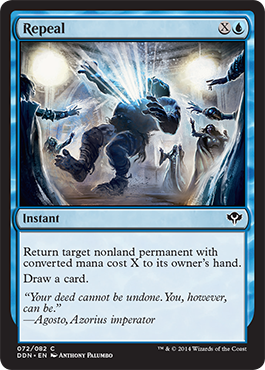 Repeal is one of my favorite cards of all time, and getting to use the bounce spell on a token is a truly wonderful experience. 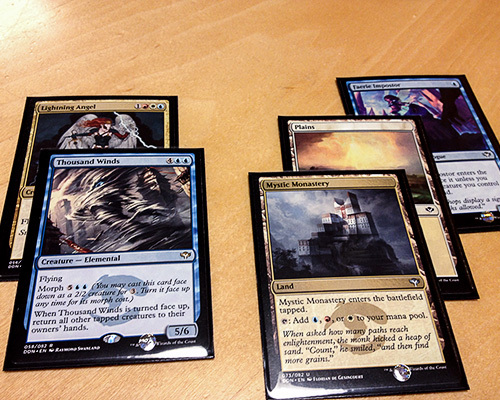 As the tokens get bigger, so does my glee at Repealing them away. This one was just a 1/1, but I was pretty giddy nonetheless. Oh, and I also got to cast Whiplash Trap for its trap cost. Nate's Beetleback Chief looked pretty good entering the battlefield, but it looked much worse as all of its friends disappeared. From there, I was easily able to take the first game. The second game turned on a similarly tricky plan, as Nate faced a board that looked much like this. The Cunning deck has a number of morphs in it to keep the opponent stumbling along with your shell game, and Nate definitely fell into my trap (although, this time, not into a Trap). His Bone Splinters looked to clear the way for his creatures to attack safely, but Willbender turned it into a three-for-none, a hole from which Nate was never able to recover. 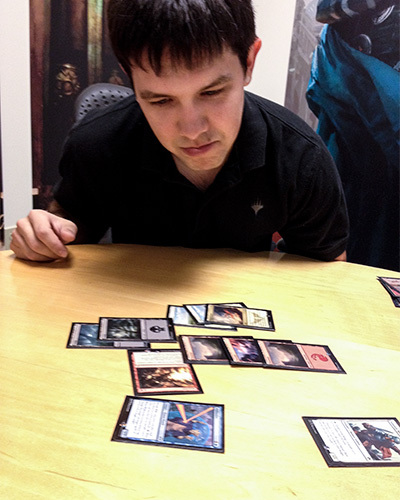 Next on the chopping block was Mike McArtor, DailyMTG.com copy editor and lover of all things Orzhovian. Naturally, he selected...Cunning? It turns out Mike loves Arcanis the Omnipotent just as much as I do and wanted nothing more than to draw three over and over and over again. This time, I'd have to see how the other half lives. The other half, it seems, lives pretty well; especially when the other half is running alongside Ogre Battledriver. Mike started out by Mana Leaking my early Goblin Bombardment, but that ended up leaving him vulnerable to Ogre Battledriver into Krenko's Command. I even unearthed a Dregscape Zombie and used it to Bone Splinters a blocker out of the way. 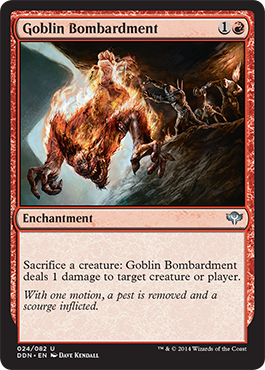 I was doing well, but I'll admit I was kind of sad about not getting to resolve Goblin Bombardment, especially with that new art. Mike was done but not out. He cast Steam Augury with a certain amount of glee, flipping up some major business. How in the world am I supposed to choose with all of these new cards?! Nice flip! 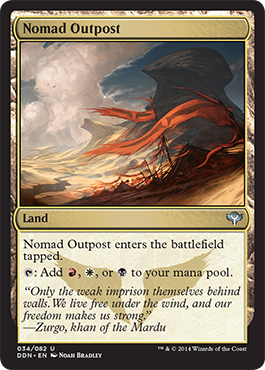 He ended up placing the powerful rares in one pile and the land plus Faerie Impostor in another. I was ahead and he was a little tight on mana, so I opted to give him the powerful spells in hopes that my cheaper ones would tempo him out while he was stuck casting one spell a turn. The plan worked! Bone Splinters and Fleshbag Marauder kept the table clear of any bombs, and Speed won its first game without Mike ever getting to flip up this guy. 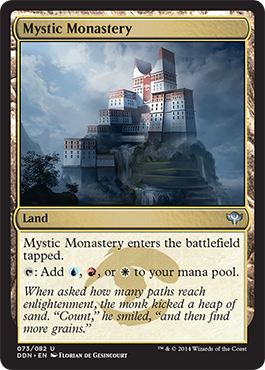 Jeskai...Mardu...there seems to be some kind of pattern developing here. 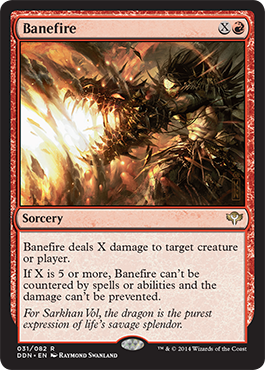 In the second game, however, I felt the full force of Mike's Cunning, as well as the final Khans of Tarkir card found in Duel Decks: Speed vs. Cunning. 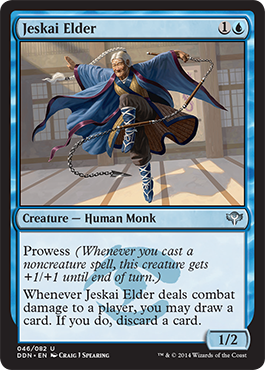 Jeskai Elder is a kind of battle looter with prowess, meaning you never know if it can suddenly get bigger in combat...just like Mike did when he cast Impulse! To make matters worse, Echo Tracer bounced a creature, then got to do it again thanks to Faerie Impostor. Lightning Angel served as the cleanup, and even a hasty Krenko, Mob Boss wasn't enough when Whiplash Trap undid his deeds. That meant our battle came down to a third game—a game that was entirely about a certain destructive clan leader: Zurgo Helmsmasher. Zurgo came down and immediately put Mike in a bind. He had to take a whopping 13 damage in a single turn before sheepishly casting Lightning Helix on Zurgo on his own turn, since Zurgo couldn't be killed while it was my turn. 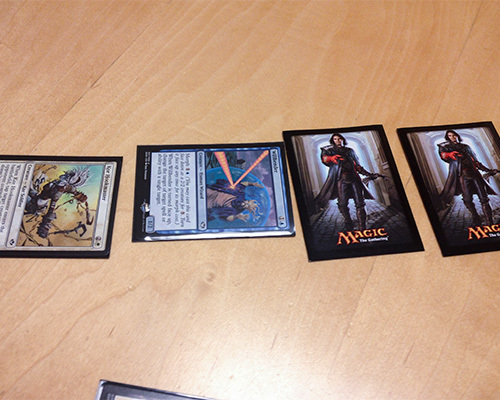 But the rest of Zurgo's crew was happy to clean up the mess in his wake, giving Speed its first match win. Clearly we needed a tiebreaker. Clearly I needed Matt Danner. Matt Danner is one of our associate brand managers and is a bit of a secret ringer for the brand team. I knew if anyone was going to challenge my clear dominance in the Duel Decks arena, it was going to be Matt Danner. Danner is a cunning fellow, so, of course, he chose Speed. Because I can't read people, apparently. 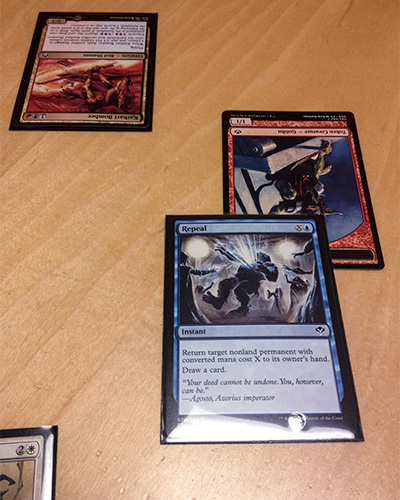 Either way, Danner was set on smashing some face with the Mardu clan leader. But what actually happened is that Danner found himself ambushed at every turn. First, this unfortunate attack caused him to exclaim, "But I can't beat a 2/4!" That Hussar Patrol gave me just enough time to set up Arcanis the Omnipotent for the first time all day. Let's just say I drew quite a few cards over the next three turns it actually took to close the books on Danner. The second game was back and forth for a number of turns. Whiplash Trap kept me from falling too far behind, and Fleeting Distraction drawing a Swift Justice barely allowed me to keep the game close. Eventually, I managed to attack for 3 per turn to put the game within reach of closing out. However, Danner was a cunning one, as I've said before, and he had a plan. He poked and prodded as the situation presented itself, even as I was taking over the board. His ultimate plan? I had 7 life. He had eight mana. His plan had come to fruition. No, no, that's okay. I don't plan to counter it anyway. Willbender is one of the tricksiest of morphs, and definitely one to watch out for. Danner certainly learned his lesson. And with that, Cunning came out on top—barely. 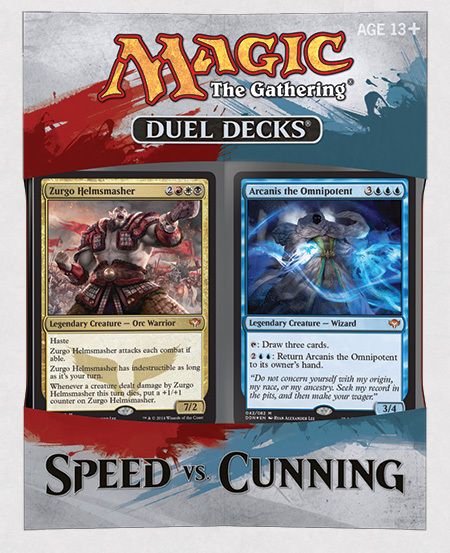 Which will you choose, when Duel Decks:Speed vs. Cunning releases September 5?